Over the past year, much has changed at ActiveHistory.ca. Long time editors Ian Milligan and Kaleigh Bradley left the project as their careers have taken them in different directions, while we’ve added three new contributing editors to the team (Welcome Stephanie Bangarth, Erika Dyck, and Colin Coates!). Following New Directions in Active History, a conference we held last fall, we launched a new exhibits program and revamped our ‘papers section’ into one more focused on ‘featured projects.’ Over this time we’ve moved increasingly towards publishing series of short essays, on topics including Confederation, Indigenous history, Marijuana policy, and Canada’s history of welcoming refugees, and Technoscience. Canada’s First World War, a web series edited by Sarah Glassford, Chris Shultz, Nathan Smith and Jon Weier, has published nearly forty essays and tomorrow will launch a new partnership as part of their work (I won’t spoil the surprise here!). 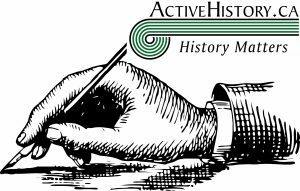 New contributors: If you have a short 800-1,200 word essay that you think would be of interest to our readership (historians and history-professionals, policymakers, journalists, and the broader public), please send it along to info@activehistory.ca. Submissions should be clearly-written and original, and we encourage the inclusion of images and other media. We can usually get new posts up within a couple of weeks. New Regular Contributors: On Thursdays, we run posts written by people who write for us on a regular basis (4-5 times a year). Taking on this task allows you to develop ideas over time, become more familiar with the project as a whole, and, for many, provide opportunities for structured reflection on key issues facing our work as historians. New Contributing Editors: This year we introduced new contributing editor positions. People who have agreed to build the project in this way help to invite new contributors to the project and/or have coordinated a theme week or web series for the site. If you are interested in taking on any of these roles, or would like more information, please drop an e-mail to info@activehistory.ca.